I've been talking with guild members about our October trip to Walt Disney World. We can make food reservations beginning on April 14th so I'm trying to decide where, exactly, I want to eat and to get people who have expressed an interest, committed to coming to the vacation. 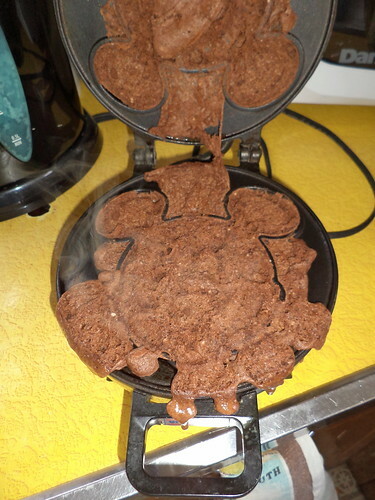 All this Disney talk put me in the frame of mind for waffles. This has been a staple of the family since 1990. I wasn't sure when the last time was that I'd used this. It was quite dusty on the box top, so it has to have been over a year ago. The interior was a bit dirty so I scrubbed it before plugging it in. The interior is ostensibly non-stick but I need to remember that, after so many years, the non-stick needs help. I forgot with the first waffle. This wasn't as bad of a mess as it looks. 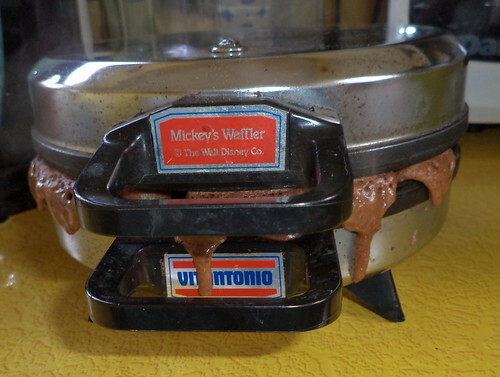 I unplugged the waffle iron and used a fork to peel everything out of the iron. This tasted good so I put the debris in a freezer bag and I'll use it on ice cream. 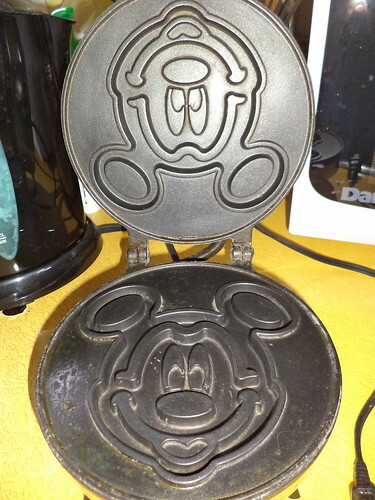 The other issue I had was not knowing how much to actually put in the waffle maker. One-third cup was too much. One-fourth cup was too little. After dirtying two measuring cups, I settled on a bit shy of a third of a cup. What's always the issue is getting the batter into the ears so you get a full ear. 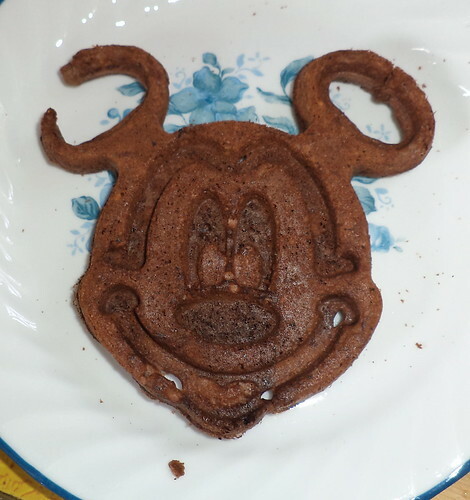 The ears can, with the right amount of batter, fill in, but it's much cooler to have them be the circle. 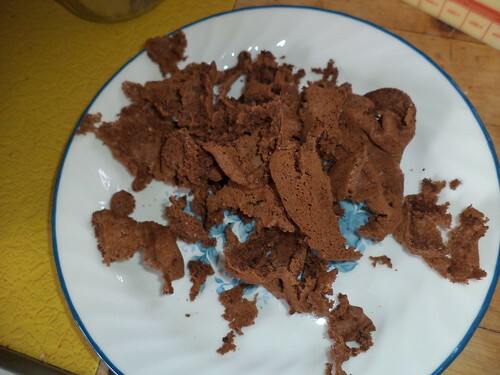 There was enough batter to make several waffles. I have no idea how long I have had this recipe. I also don't remember where I got it. Given the paper, probably from a magazine. 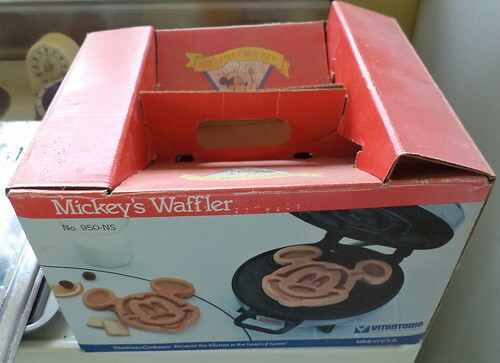 Shockingly, I have no pancake/waffle syrup in my house. I'm not sure how that slipped from the grocery list. 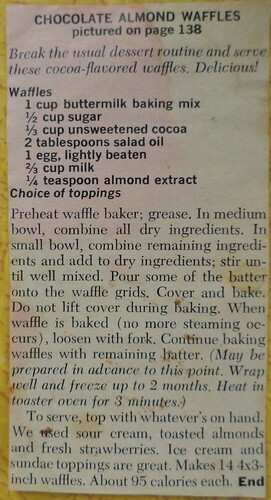 However, this particular waffle does not benefit from maple syrup. These are best served with whipped cream. I have enough for two meals, assuming I eat two waffles per meal. 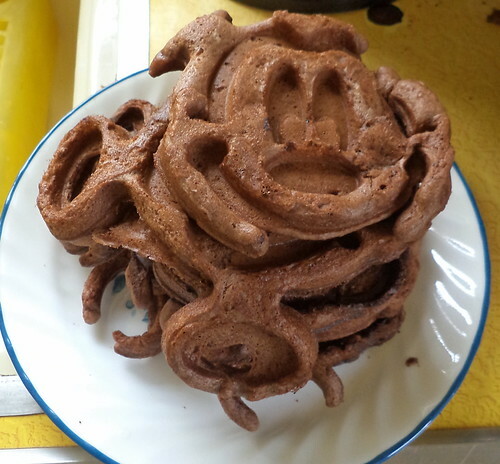 So, one lunch this week will be waffles at the office. I hope they are all jealous.